In this fast-paced world, people have become accustomed to accomplishing a task in only a few clicks of a mouse. In a business setting, this translates to employees wanting applications, services and other workloads delivered just as fast, which puts a strain on IT administrators, and brings up issues of governance and control. 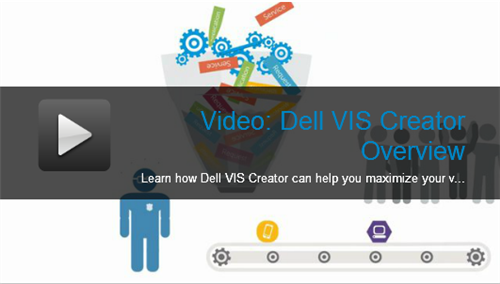 Since August 2010, Dell has offered VIS Creator as a solution to this workload delivery problem. VIS Creator enables IT administrators to improve response time and control by empowering authorized end users with an automated, policy-based, self-service tool for quickly deploying hybrid cloud, physical and virtual workloads, including virtual desktops. In this Q&A with Tom Baumgartner and Narendar Shankar from the Dell Virtualization Solutions marketing team, they discuss how Dell is expanding on these capabilities with today’s release of VIS Creator 2.1. Q: Since its initial release, how has the solution evolved? A: VIS Creator has evolved from a single automated provisioning and lifecycle management platform for heterogeneous private cloud and virtual server and desktop workloads to one that now supports hybrid cloud and physical workloads, as well. Q: In the area of workload delivery, what is new in this release? A: VIS Creator now supports hybrid cloud service delivery and support for heterogeneous physical resources from Dell, HP and Cisco. We’ve also added Creator Workflow Designer, which is a design center for visual workflow editing and accelerating private cloud and virtual desktop infrastructure (VDI) deployments. Q: As businesses expand to private, public and hybrid clouds, they are faced with issues of security and governance. How does VIS Creator help solve these? A: VIS Creator lets IT administrators pre-determine resource governance in a multi-tenant, shared infrastructure and rapidly deliver workloads to end users. This gives IT departments control, flexibility and the freedom to allow those end users to access the resources they need, when they need them, but only those resources that they’re authorized to access. Q: Since end users will find it easy to create physical and virtual workloads, how does VIS Creator 2.1 help with lifecycle management and VM sprawl? A: VIS Creator is a policy-driven solution for controlling virtual machine sprawl and accelerating adoption by automating the process of provisioning, reducing, reusing and recycling of compute resources in a shared virtual environment. Lifecycle management policies in VIS Creator control how long virtual machines can exist, and process automation orchestrates the decommissioning and reuse upon lease expiration of those machines, and reclamation workflows can be customized to meet the requirements of each business unit. Q: With all these enhancements, what characteristics will VIS Creator maintain? For more information, visit dell.com/viscreator or to learn more about other VIS solutions, visit dell.com/vis.